CHRISTMAS IN LIBYA – first published in New Panorama in Nerja, Malaga, Spain in December 1988. The usual festivities of Xmas eve – carol singing, mince pies, hot toddies. The scene is set – the Christmas tree in place (obtained from the Jabel in an illegal raid), glittery decorations hanging in loops, cards festooned around the walls. People gathered – drinks in hand – large glasses of brown liquid to soothe throats after the singing (the Presbyterians of Ulster would be horrified!). Some red stuff too. Beda wine – this year’s or last year’s vintage. Who cares by midnight anyway. We are all in the rosy glow added to by the festive season. The expatriates are in good form. It’s a happy band not at all intimidated by the rigors of the world outside the large wooden doors and high walls around the villa. The weather is reasonable. Perhaps a little windy. This sends a chill through our bones as we step outside. It’s all relative though – summer is about 40 degrees centigrade and the temperatures at this time of the year seldom fall below 15 degrees. So where are we? Benghazi, Libya, easy of Tripoli by about 1000 kms – a seven hour drive to the Egyptian border – Rommel country in WWII – the Desert Fox. It is 13 hours to Crete by boat, and, according to Adrian Keane’s book “Walking on Water – my escape from Ghadaffi’s Libya” landing on the Greek island of Gavdhos which is served by a ferryboat from Crete twice weekly during the summer season. Xmas Eve is spent pretty much the same as it is all over the world, oblivious of world opinion about the hotspot often discussed at length in the media. Where is the problem? The only disadvantage about spending Christmas in Libya is the shortage of foodstuffs. This seems strange at first, not being able to nip down to Sainsbury’s and buy a bottle of Xmas brandy, Christmas Day and a hangover (my apologies to my Presbyterian friends). It’s just like home. Hangovers are the same anywhere. However, we struggle bravely on. Drinks around 10am kick off the day to a good start. Then we pile in the cars and go down to the Mediterranean for the obligatory Xmas swim. It’s still a little windy but not devastatingly so. The road is dry and the sun is out. In fact, the weather could be described as “crisp” but certainly not cold. The particular beach we choose is 40 kms out of town to the south. We frequent the beach often in the summer, those halcyon days of sun and sea, ah, we await their inevitable return. It’s a different scene than in the summer. What is normally a gentle lull of waves on the shore is now a crashing maelstrom of water. There has been a storm out at sea. The greenery around encouraged by the rains which started in October are a far cry from the dust and yellowness of the summer. We plunge into the Med. Somebody says something about brass monkeys. It’s not that bad! Trafalgar Square on New Year’s Eve is much worse! Who said you need a wetsuit? Five minutes in is long enough though and we emerge, shivering mainly from the wind, and quickly dry ourselves off and dress in sweaters and jeans. The flask comes out – black coffee with a drop of the hard stuff – flash, the illegal spirit brewed by the hardy Polish expatriates, including big Stan whose shorts never quite fit. I digress. The drink warms all the necessary parts beautifully and we sit and chat in the cars before driving back to Benghazi for lunch. The table is laden with goodies – you could be in Europe! Roast turkey, locally grown, bought as soon as they appear in the shops and frozen. You never know when they are going to disappear from the market again. Except ours is fresh. It is bought in the mountains from an Arab farmer and brought home in a sack. The guys who fetched it had a problem with a road block. The Army fancied the turkeys and nicked one for themselves. It was only Mick’s quick thinking that stopped them nicking both of them. However, that story is not for delicate ears. It spent a week running round the kitchen in Mick’s flat before we could find anyone to kill it. I digress again. I wish I would stop doing that. Nasty habit. Vegetables are potatoes, carrots and beans. We have been storing them in the freezer for months. Probably more months than we should. However, playing things by the book in Libya may mean we don’t have any vegetables at all! The rest is flown in by us. Xmas puddings, mince meat, cranberry jelly, bacon (tut tut – offending Islam now) and other trimmings have to be brought from overseas. Hams, port (contraband of course), Christmas crackers, yule logs. The customs men would have had a heart attack if he had seen all of these goodies. Fortunately most of are adept at distracting them when going through customs. As for me, I am cute with blonde hair and blue eyes, and very petite. Just the sort the Arabs like. It is my job to distract them while Brian pushes the trolley through customs. Here I go again. Digressing. Sorry chaps. We sit down to a massive feast and pull cracker and wear silly hats, drink the illegal brew. It always tastes better when its illegal. Wine, beer and other concoctions. Then we crash out in front of the video. No circus on the box here, but films carefully chosen for “the day”. It’s 8pm. There’s a choice between going visiting or watching more videos and topping up our intake of alcohol. We feel mellow, so we reach for the wine bottle. The wine has been carefully nurtured and stored after bringing hundreds of kilos of grapes from the Green Mountain. We clutch the bottle in hand and don’t let go until it’s empty. Then we collapse into bed, tipsy but happy and look forward to the New Year festivities. Libyan is supposedly a dry country but today we have consumed more alcohol than we would have if we had been at home. It’s a tough life in Ghadhaffi’s country. This fits into the general theme of the LetsGoEast project under culture. The projects are linked on the web site – walking, culture and language. The Spanish group of the East Antrim University of the Third Age went to Competa, near Malaga, from 14-28 April 2018. There were a variety of events and activities. 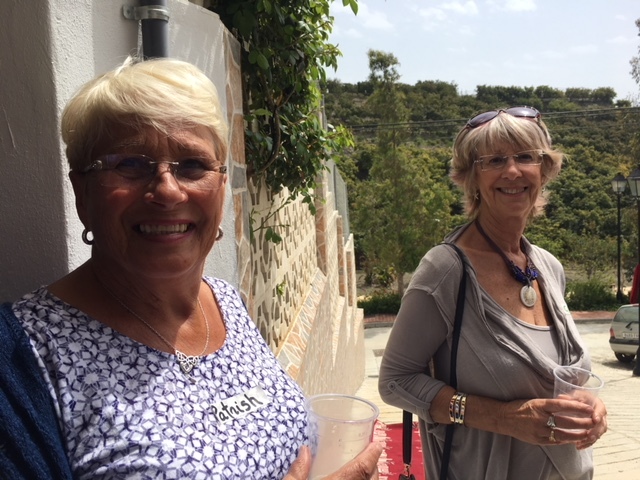 A trip to the local vineyard, a guided tour of the village, lunch with the U3A Axarquia in Velez Malaga, a walk to Canillas de Albaida… a lovely little village about 4 miles from Competa. I am Tina Irving, the ex convenor for the Spanish group in the local U3A in Carrickfergus, and led the visit. 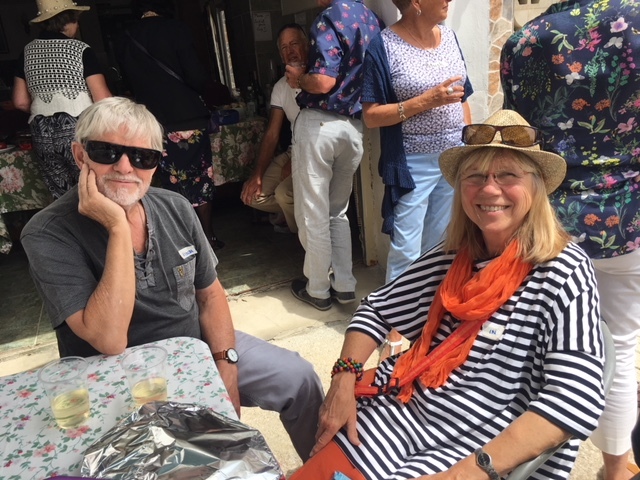 I have spent over 30 years in Spain on and off, going to Madrid University in 1995/96 to study Spanish as part of my degree in Spanish and IT at London South Bank University. 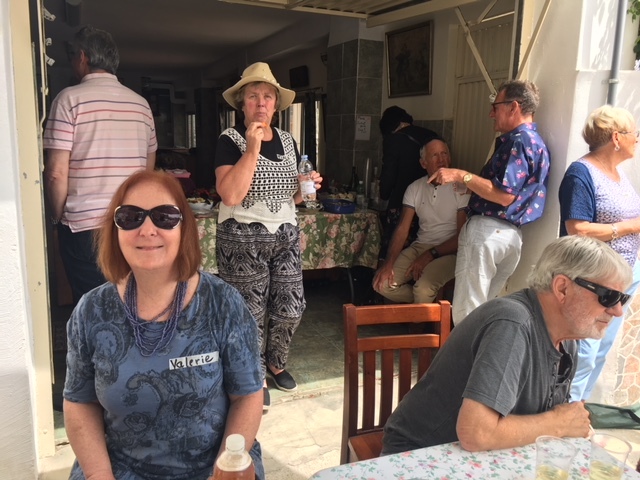 I first went to Competa, a small village in the foothills of the Almijaras… great walking country….. Competa is now a thriving town with shops, restaurants, a very nice hotel, B&Bs, banks, a town hall. Competa is at the apex of the road from the coast roads from Algarrobo Costa and Torrox. I bought my first house in Competa in the “campo” in 1986. It was an old finca which I renovated over 15 years and then sold. I also had a town house which I also renovated and sold. In 2005 I bought an old house in Canillas de Albaida near Competa and started to renovate… then came the financial crash of 2008 and eventually the project was sold to a local estate agent who has finished and sold it. It looks beautiful! My astute reader will have spotted all the turbulence concerning the opening of Scotland’s new route, ‘North Coast 500.’ All the great and the good and their slavish adherents are gathering to praise it and be associated with it and all the agencies are rushing to put cash into it; fine, certainly it is a step forward – or many steps since the route is 500 miles long (well, around 500 miles long) – and it will boost the Scottish economy. The name and idea are not original though. Basically it is an amalgamation of some existing routes; in fact there is nothing novel even in the concept. Other countries have a ‘500 mile’ route (even a 500 kilometre route) of one description or another. The comparison with Scotland’s latest walking route to the ‘Route 66’ of the United States is hardly apt though. The question for Caithness is how the 500 will fit in with the Great North Highland Way (GNHW), the walking project being supported by a small but staunch band of enthusiasts both in Caithness and along the north coastline of Sutherland. Very well, I should think. The two routes do overlap and should synergise with each other. The world-wide publicity surrounding the ‘500’ can bounce to good effect with the GNHW. In fact, of the two routes, I believe the most fruitful could well be the much shorter GNHW. I base that on the success of the existing West Highland Way that runs from the town of Milngavie in the central belt to Fort William in the north. The West Highland Way, in essence, starts from a rail head and ends in another one and is so structured to fill a week’s holiday for those walkers coming up from the south. Given the length of the proposed walk of the GNHW that fits in with either a two week walk or a one week walk depending on where one starts – the shorter, one week walk being from Thurso. Tina Irving introduced both Ian Ellis and Easyways to the concept of the Way. Easyways has become a firm supporter of the concept of a dedicated walking route across the top of the world; they have already committed some cash into the project and have had enquiries about walking the route already. And these enquiries have come from around the world: Andrew Fernie of Easyways considers that, although the Aurora Trail will not top the 80,000 or so walkers that the West Highland Way achieves annually, such is the interest that my reckoning of ten per cent of that number could be readily attained (and, as an aside, Paul Monaghan, the SNP candidate for the constituency has also given his not inconsiderable support to the project). Cash though! That dreaded word cash. Where are we in raising the necessary finance required to run and maintain such a route? The feasibility study has now been completed and is available to be purchased. This study was carried out under the auspices of letsgonorth.com assisted by London South Bank University. It furnishes a report on the infrastructure required to bring the Aurora Trail (or the Great North Highland Way, if you prefer it to be called) into viability along with an assessment of its potential economic impact on the north (a good impact) as well as a full marketing plan. It also provides structural costs and thus there is a costed out business plan in it. And the feasibility study is for sale for relatively little (cost price almost); after all the people who undertook it do need to recoup their expenses, so that brings us back to funding. There is a loop here; some bodies will not consider funding until they have sight of the feasibility study and, therefore, until money is put in to purchase this none of their money will be forthcoming. Given the low cost of the study perhaps that may not be a problem for too long. Once the study is generally available then several bodies will consider aiding with the capital costs of the route – notably Highlands and Islands Enterprise, the Big National Lottery Fund (as per John Thurso) and Scottish National Heritage amongst others. The running costs are the problem, however. But, even here there is hope. Highland Council have said they would consider the matter once they had sight of the feasibility study and, really good news, SSE, the company that owns wind farms in Caithness, have also said they would consider an application (but only after October when their new sponsorship scheme starts). This is especially welcome since SSE is a co-sponsor of the Loch Ness Way and is always keen to put something back into the local communities where their wind farms are based. Other private companies of goodwill towards Caithness may also be interested but IGas (Scotland) are too involved in the variability’s of the oil market at the moment and Atlantis Resources feel, rightly, that they want to get their feet tucked under the Caithness plateau first before they do anything. I have a feeling though that once one sponsor commits others will follow and, although it is appreciated that a willingness to look at a proposal does not mean adopting that proposal, it is a first step and I will be keeping in touch with all the potential financial helpers. I am confident that this aspiration of the Caithness Waybaggers on the Nineties will come to fruition and that we will eventually see the great and the good eulogising over the Great North Highland Way and congratulating themselves on their foresight in supporting the concept — ok, I’m being sarcastic. Note.. this article was written by Bill Paterson in 2015. We have made considerable progress since then. No money but much more research. HIE want everything for free, despite the fact they do not have a feasibility study or business plan for the NC500. Why, then, are they asking one for free from us, as well as the 15 years of research free of charge. We are working with an excellent company who are helping with the North Highland Way. Horse riders are also helping out… thanks girls!